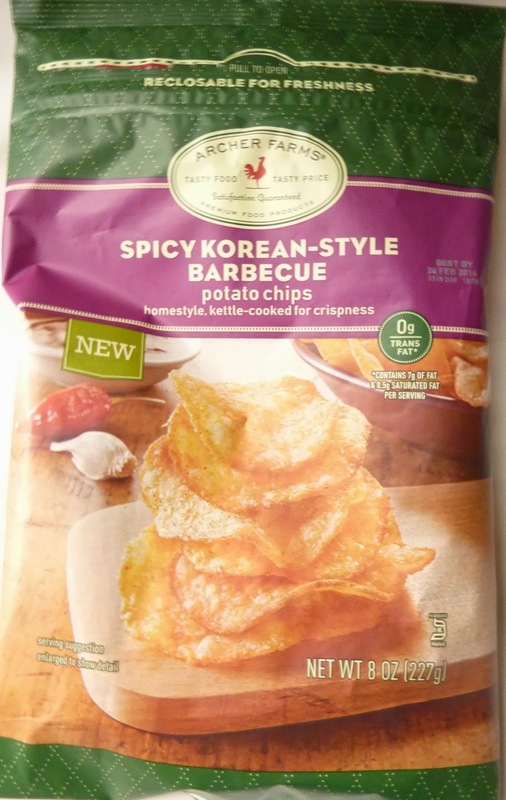 These are very similar to the previously-reviewed Sweet & Spicy Chips. There's just a very subtle difference between the two sets of seasonings. I suppose these do taste more...Asian than the Sweet & Spicy dealies, although these could also be described as "spicy and sweet." These chips have rice flour and a couple of soy-based ingredients, which I guess pushes them in the direction of a Korean BBQ flavor. They certainly don't taste like freshly-seared bulgogi or ribs, but they're not bad for what they are. They flaunt a similar texture to the aforementioned Sweet and Spicy Chips or even the Garden Vegetable Ranch kettle-style chips. They're extremely crispy. I think if you're looking for a spicy kettle chip, the Sriracha variety is the way to go. But if you want something with less heat, but that still has some kick and a nice bit of tang, these are a viable alternative. Anything's better than the Rib Chips, which I believe, thankfully, have been discontinued. Since those awful things, I haven't been terribly disappointed with any Archer Farms offerings in the chip department. You really can't go wrong in that aisle these days. Leave a comment if you agree, disagree, or have anything to add! Also let me know what to review next! Anything expensive you've seen there in your Target's freezer that you've been scared to try? Let me know! Holla' at me, my fellow Archer Farms fans!